This mega-fight boxing event features Boxing superstar and 6-time World Champion Floyd “Money” Mayweather taking on welterweight mega-star, five-time World Champion and current WBA Welterweight World Champion Sugar Shane Mosley this Saturday night May 1, 2010 9PM ET/6PM PT at the MGM Grand Arena in Las Vegas, Nevada. The fight will be at Welterweight limit 147 pounds and will be shown live on HBO pay-per-view (PPV﻿). 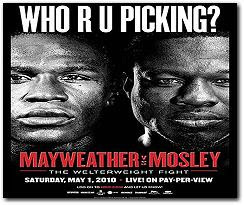 Don’t forget to watch Mayweather vs Mosley Live on HBO PPV this Saturday night May 1, 2010 9PM ET/6PM PT. For more background about the two boxer leading to the fight night event, watch Mayweather vs Mosley HBO 24/7 Series.